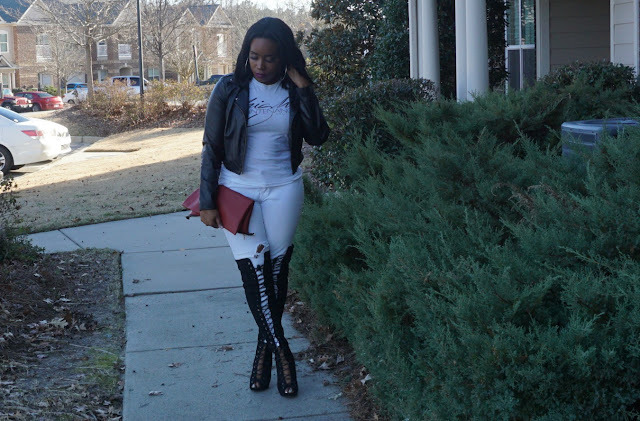 So after the little bit of the "sprinkle" or snow that Columbia experienced over the weekend, I was inspired to come through with this all white outfit. I am love with the colors black and white lately, and I feel that they are becoming my favorite colors. Neutral colors are my thing now that I am getting older (I will be 25 this year). Sunday's are meant from relaxed but cute looks. So I wanted to keep it that way. 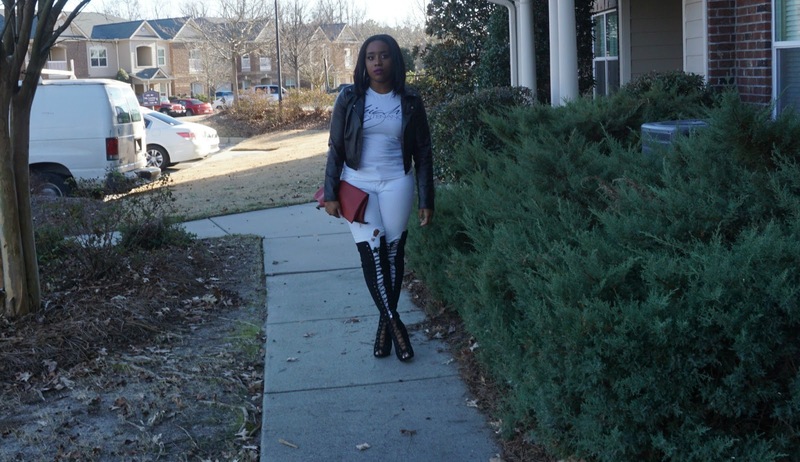 As you all know, I am in love with High Maintenance Boutique and I think I just about wore this top out, so I know it is time for another one. My bottoms are from Charlotte Russe, and I recently wore them in my post Crisp and Simplistic. Like I said before, these bottoms may be on their last leg to, however, I still manage to get some use out of them. Applying this leather jacket that I bought from Ross about 3 years ago, added a nice edgy look to this outfit. It actually managed to pull everything together! And these boots hunny have been in my closet for about a year now. My mom actually ordered these from Fashion Nova. If you cannot tell by now, I am loving all of their merchandise. How can a girl not? Comment below for post that you will like to see in 2017.